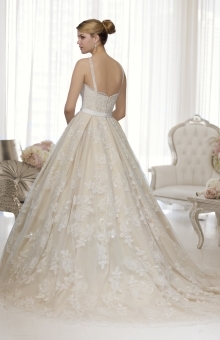 It’s your day; make it memorable in this stunning ball gown wedding dress fit for a princess. The bodice features hand-sewn jewels on vintage-inspired corded lace. Scalloped lace trim runs along the V-neck, shoulder straps and hem. Zip up back. Detachable Grosgrain ribbon sash included.